Allen & Heath Qu Series consoles offer an impressive amount of features at an affordable price point. The series consists of the Qu-16 and the recently introduced (in January) Qu-24. Both models offer similar capabilities, with the main differences being channel count, and the larger Qu-24 offering a few more bells and whistles. 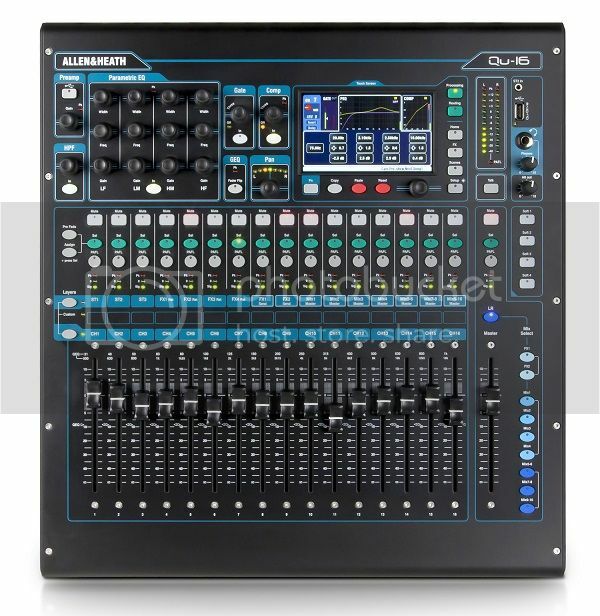 Still, while smaller, the Qu-16 manages to pack a lot into a rack-mountable desk, including 16 mono/line channels with both XLR and TRS inputs, 3 stereo line inputs and a talkback mic input. Up to 24 sources can be supplied to the mix, and 12 output buses are available, including 4 mono aux, 3 stereo (or mono) aux and main left/right outputs. An additional 2-channel AES digital output is patchable from any mix, as is a stereo alt output. Processing and effects are ample, including 4 FX engines with dedicated FX return channels, and a compressor, gate, high-pass filter, delay, and 4-band parametric EQ on every input. Output buses are also outfitted with delay and compression as well as a graphic EQ as well as graphic EQ and 4-band parametric EQ, with an additional 2-track output supplied to interface with a separate recording unit. Speaking of recording, Qu Series consoles offer built-in stereo recording and accommodate 18-track recording when linked to an external hard drive via the Qu-Drive port. In addition, the console can stream 24 channels of audio to and from a Mac via a USB port. An 800 x 480 color touchscreen is provided, and the console also interfaces with a remote iPad using the Qu-Pad app that includes access to mix parameters, setup features, and even a large meter screen. A dSnake port facilitates connection to AR2412 Audio Racks as well as the AR84 Expander Audio Rack for expanded and remote input capabilities. 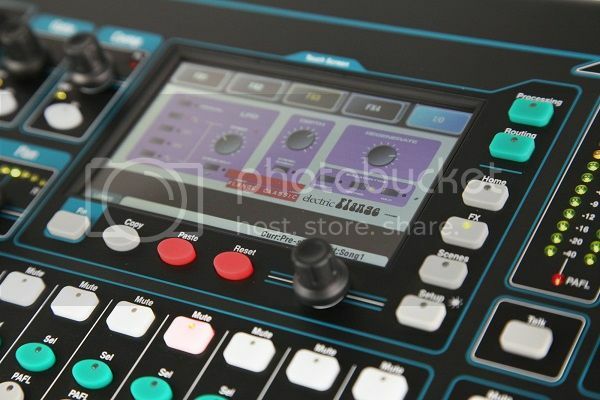 And, the platform is also compatible with Allen & Heath ME personal mixing systems. My first impression out of the box is that the Qu-16 is a great-looking board, with a distinctive shape and rugged design. The surface contains 17 motorized faders and offers three layers. The first is the standard mix layer, the second gives access to the 3 stereo channels, FX returns, FX sends, and mix masters, and the third is a custom layer. A set of layer selection keys are located on the left just above the fader bank. Above the faders are mute, select and PAFL keys, as well as signal and peak LED lights. At the top left is a "Super Strip" area that contains gain, HPF, 4-band parametric EQ, graphic EQ button, gate and compression knobs. and a pan knob. Adjacent to that is the touchscreen, with dedicated cut and paste buttons right below. A scrolling knob and screen selection buttons complete the screen area. To the right of the screen is the main LED meter display as well as the Qu-Drive USB input, 1/8-inch TRS stereo 3 input, headphone jack, headphone volume knob and ALT out volume knob. The master section contains the master faders, as well as mute, select and PAFL buttons, and signal and peak lights. It also houses the mix select buttons that allow users to choose between the main LR mix, FX1, FX2, and mixes 1 through 10. Four assignable soft keys complete the surface controls. 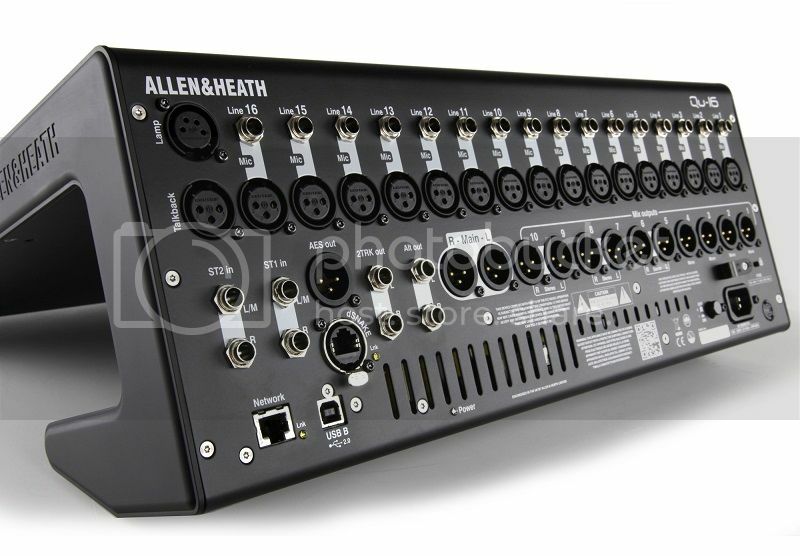 The rear panel offers 16 XLR and 16 TRS inputs, 10 XLR mix outputs, L/R XLR outputs, a pair of TRS ALT outputs, a pair of TRS 2-track outputs, an AES digital output, a pair of TRS inputs for stereo 1 and 2, and an XLR for talkback mic input. Rounding out the panel rear are a network connection port, USB B streaming port, dSnake port, lamp socket with Kensington lock slot, power switch, and IEC power cord connector. The mixer is very intuitive to use and within a few minutes I had a grasp of all the mixing functions without needing to open the manual. When I did finally look at the manual I found that it explained all the functions in a very clear and concise way, unlike quite a few of the gear manuals that I've had the (dis)pleasure of trying to decipher. The FX units sound great, and it’s easy to change the parameters and dial in the sound that you're looking for. I really like the assignable soft keys. They allow the operator to set up the console for their style of working and places functions like mute groups, scene recall and even tap tempo for the FX units right on the surface, rather than buried in a menu. Allen & Heath's U.S. distributor, American Music and Sound, also provided a small hard drive unit with the mixer. It contained new firmware (which is already on the website) as well as some audio files. Loading the new software was a breeze. I simply plugged into the Qu-Drive and a few pushed buttons later (via the setup menu screen), the unit found the update and loaded it automatically. The console also discovered that the hard drive contained some music files, including a few multitrack files. Touching a track name on the playback menu loads the file, and pressing a button labeled with a USB symbol located above the input gain on each channel, switches the input over to the playback track. Very handy for virtual sound checks! In fact, the recording capabilities of the console should satisfy the most demanding users as you can both stream audio to a Mac or use an external hard drive to record stereo or multitrack. And after the gig, the same console can be used to mix down the recording. Confident with the form and function of the Qu-16, I took it out to some gigs. The first few shows were typical small corporate meetings with podium microphones, wireless lavaliers, and audio playback. The console provides a lot of routing options, so it was very easy to hook up everything, and quickly. With the onboard 4-band PEQ and graphic EQs available on the outputs, I had no trouble ringing out the systems and getting a great sound from all of the mics and playback material. The onboard recording feature was handy in making a safety “board tape” of the events. Next, I utilized the Qu-16 console for a wedding at a large hotel. We provided both a PA for the ceremony in a garden and for the subsequent reception in the ballroom for several hundred people. With the garden system, the console handled several inputs, including a mic for clergy, a stereo DI from a keyboard player, and a music track via an iPod. The feed went to a pair of active loudspeakers hidden behind bushes. It was easy dialing in the PA in the limited time allotted, and most of all, it was a nice change having a compact digital desk with full parametric and onboard GEQ instead of having to drag out a rack and an analog desk with limited channel EQ and separate outboard EQs. If you're in the market for a compact console that sounds great, is loaded with tons of useful features, offers connection to remote stage boxes and personal monitoring, provides remote operation via iPad, and hosts a ton of recording option, look no further than the Qu-16. And for those wanting more inputs channels, there's now the Qu-24.